916 р. Average price online * 916 р. 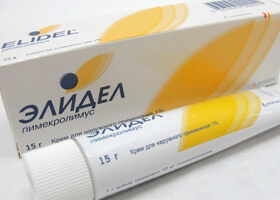 The drug "Elidel" is a dermatotropic (acting on the skin) pharmacological agent that has a local anti-inflammatory effect. The main active substance in this preparation is Pimecrolimus, which is derived from macrolactam ascomycin. "Elidel" is recognized as an effective drug in the fight against atopic dermatitis and its main symptoms, as evidenced by a number of clinical studies, however, not all of them have been fully completed. This drug has a selective inhibitory effect on the formation of specific substances - cytokines and inflammatory mediators (compounds that trigger the inflammatory response). These substances are secreted by specialized cells, the so-called lymphocytes and mast cells. The active ingredient of the drug is able to bind to the receptors of these cells and block the activity of a special enzyme called calcineurin. The block leads to a violation of the increase in the number and differentiation of lymphocytes, as well as to a decrease in the release of those same mediators and cytokines (interleukins, interferon, tumor necrosis factor). This mechanism is carried out mainly in the affected areas of the skin, however, in patients there is also a general response of the immune system to the administration of the substance. 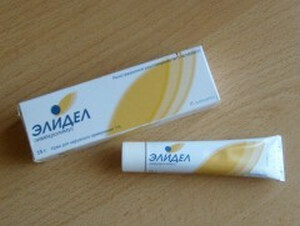 The cream reduces itching, its swelling, redness, reduces the temperature of the inflamed areas. "Elidel" is able to have a therapeutic effect on the areas of affected skin in both adults and children (from 3 months of age) and adolescents. 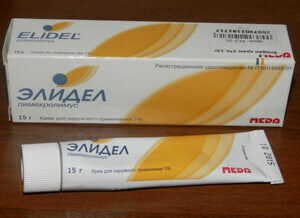 Since this substance is produced as a cream in a tube, the only way to use it is external. The drug is recommended to be applied to the affected skin on any part of the body immediately after the onset of the initial symptoms, rather thinly and carefully rubbed. The substance is used 2 times a day. If after 6 weeks the symptoms of dermatitis do not subside, the doctor should think about clarifying the correctness of the diagnosis. If the treatment was successful, and the symptoms regressed, but then resumed, it was recommended to continue the application of the cream. In case of contact with the mucous membranes of the eyes, mouth or nose, immediately remove the remnants of the drug as thoroughly as possible and rinse everything with running water. For elderly patients, the effect of this drug is not fully understood: these people almost never use drugs to treat atopic dermatitis, since it is quite rare in this age period. For children (after 3 months) and adolescents, the dose and the number of applications do not differ from those in adults. Hypersensitivity of the body to the components included in its composition. An active inflammatory process on the skin of viral, bacterial or fungal origin. If symptoms of atopic dermatitis are present in children less than 3 months old. Netherton syndrome (a hereditary combination of ichthyosis, neurodermatitis, cataracts and hair thickening). It is especially important to note that the study of the pharmacological effect of this drug on the fetus in pregnant women, as well as on lactation, is not complete. 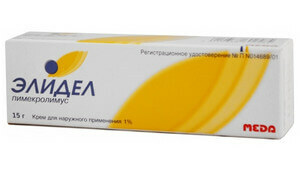 However, it is not recommended to apply this cream on the skin of the mammary glands of lactating women. Risks of use are considered insignificant for the fetus and woman bearing it. Cream "Elidel" can cause a burning sensation in the place where it was applied, as well as local reactions in the form of itching of the skin, its redness, irritation. Sometimes there is folliculitis. Less commonly, the drug contributes to worsening of the course of dermatitis, suppuration, swelling, rash, peeling of the skin, the formation of boils and papillomas. In adult patients using the drug "Elidel" because of the presence of atopic dermatitis, a study was conducted, the purpose of which was to determine the maximum and minimum concentration in the blood. So, on average in 77.5% of cases it was less than 0.5 ng / ml, in 99.8% - less than 1 ng / ml. The maximum concentration was determined at 1.4 ng / ml. Only two people had a maximum concentration of 0.91 ng / ml. In children, the study was conducted among 58 patients (necessarily older than 3 months, but younger than 14 years). Certain drug concentrations were consistently low and corresponded to those in the adults tested. The maximum value was registered only in two children (8 months, 14 years old) and was 2 ng / ml. 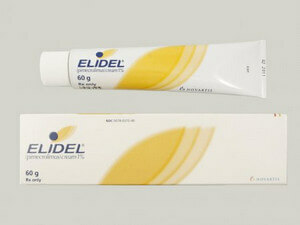 The ability to bind to plasma proteins of the drug "Elidel" according to research "in vitro" is 99.6%. And since the concentration of a substance in the blood is low enough, the determination of its metabolic characteristics is impossible. Dispensed from pharmacies by prescription. Shelf life 2 years. Keep out of the reach of children, at a temperature not exceeding 25 ° C (can not be frozen).